Whether you’re on the lookout for souvenirs or not, a walk through Chiang Mai’s famous night bazaar is always a worthwhile experience for the lively atmosphere, the food, and of course, the chance to find a bargain. The night bazaar in Chiang Mai is one of the most famous in Thailand—with good reason, as well as one of the oldest evening markets in the country. The massive sprawl of vendors goes on for several blocks and makes for an exciting evening, whether you’re buying or merely browsing the array of handicrafts, jewelry, clothing, art and more. The nearly one-mile stretch also includes side streets packed with stalls as well as the chance to sample some of Chiang Mai’s famous street food. First things first; Chiang Mai’s night bazaar isn’t the kind of place you can pop into for a few minutes. This is a substantial night market that takes a few hours to cover entirely. 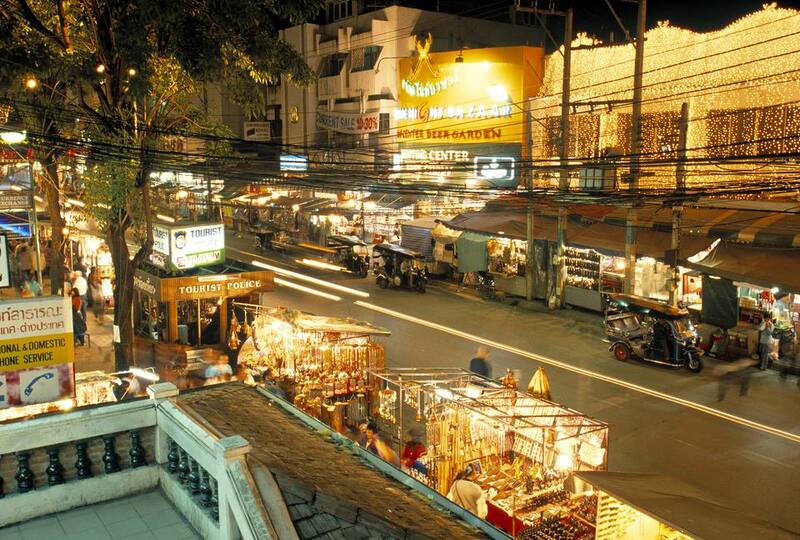 The bazaar can be found on the east side of Chiang Mai’s old walled city, centred along Chang Klan Road between Thapae and Sridonchai Roads and spreading onto smaller alleys and side streets. It might surprise you, but during the day, Chang Klan Road is a regular street lined with various stores, hotels and restaurants. But by dusk, you’ve got a main market that is nearly a mile in length. Start down one side of the street, and once you reach the end of the market, cross over and make your way back along the other side. But as you wander, make sure to peek down the little side streets to see what’s on offer because you never know what you might find. Smaller vendors often set up shop in small laneways so it's worth keeping your eyes peeled. No matter how long you’re in Chiang Mai for you should be able to squeeze in a visit to the night bazaar since it’s open every day of the year regardless of the weather, from dusk until around midnight. To see the market in full swing, arrive after 6 p.m. If you happen to be in the area around late afternoon, you’re likely to spot more than a few workers moving metal stalls and lining them up and down both sides of the main road. By the time the sun sets, the majority of the street vendors will be loading their wares into their stalls. If you want to have some breathing room as you browse, go early. If you’re cool with crowds, go any time. Your options are seemingly endless when it comes to what to buy at the bazaar. This isn’t the place to score high-end goods, but that’s not to say you won’t be spoiled for choice in terms of what’s available. And since many of the stalls end up selling similar items, don’t feel the need to snap up the first thing you see. You may be able to get that T-shirt or embroidered pillow cover cheaper somewhere in the next block. The many goods on offer include the aforementioned T-shirts, housewares, dresses, art, elephant pants, jewelry, shoes, bags, muay Thai shorts, toys, antiques, knock-off sunglasses and more. In terms of where to focus your browsing and bargaining efforts, some of the best things to keep an eye out for include Thai silks, wood carvings (bonus if you see someone in action carving at a stall), bamboo rice boxes, hand carved soaps and candles, traditional Thai clothing like the ultra-comfy fisherman pants, spices (so you can cook up some Thai goodies at home) and silver jewelry. You won’t go hungry when visiting the bazaar. Options to snack on street food, stop for a drink, or have a meal at a sit-down restaurant abound, so no matter what you’re in the mood for, you’re likely to find it. Keep an eye out for bars and restaurants set back from the stalls, of which there are many. Do note that these venues due tend to get busy from 7 p.m. onwards due to their prime night market location, so if you want a seat, arrive early to stake out a good spot. If you plan to be at the market for a length of time there are lots of options for snacks, including mango sticky rice (a great pick-me-up), fruit smoothies, spring rolls, roti (the banana version is a must-try), ice cream and various simple noodle dishes and grilled meats. Located near the bottom end of the Chiang Mai Night Bazaar on Chang Klan Road you’ll also find the Anusarn Market, which is home to a plethora of food stalls to choose from where you can find foods for affordable prices. There are a few things to keep in mind when visiting Chiang Mai’s night bazaar to make the most of your experience. Due to the sheer volume of visitors, depending on when you arrive, you’ll likely be sharing space with large clusters of slow-moving people—patience is essential if you want to avoid frustration. Aim to arrive just as things get rolling (around 6 p.m.) before the streets get clogged so you can browse at a faster pace. While you browse, remember to bargain if you see something you want to buy. Not only is it expected, but it’s also part of the fun. Prices will seem cheap by North American standards, but those prices are often marked up at least 20 percent. Just remember to be polite. There is no point in getting upset if a vendor won’t meet your desired price. There are so many stalls to choose from you can easily just move on. It’s also much easier to have Thai baht on hand if you plan to make any purchases since the majority of vendors likely won’t be able to give you change in your local currency.